My favorite place in my town is our local produce bazaar. 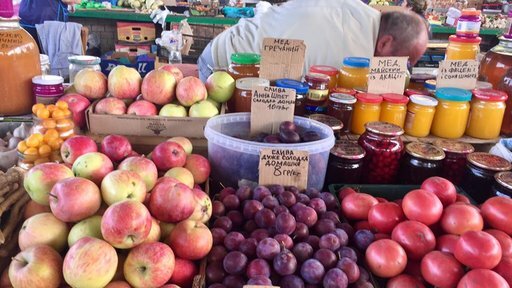 Apples, honey, plums, and other goods for sale at the bazaar. 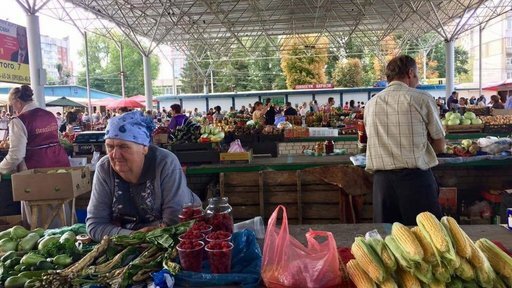 To Ukrainians, maybe the bazaar isn’t anything special, seeing as there’s one in just about every village or city, but to me it’s a pretty unique place and a huge change of how we buy groceries at home in the U.S. You can find anything here, from live chickens and their eggs, homemade pickles and jams, fresh produce, and everything in between. 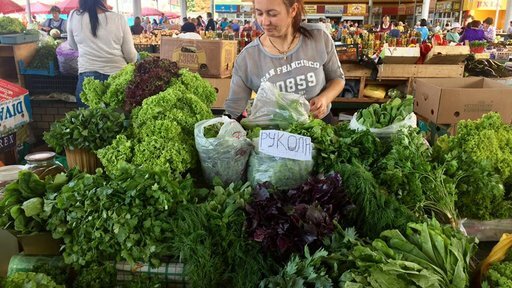 I love walking around looking at all of the colors, trying the fresh honey and cheeses, watching the selection of produce changing with the seasons, smelling all of the fresh herbs and fruits, and practicing Ukrainian or Russian with the vendors. It makes me happy that a lot of them recognize me and ask where I’ve been if I haven’t been there in over a week. They’re also patient with me while I try to figure out how much of something I need – here things are bought in kilograms, and I couldn’t tell you how many tomatoes make up one kilogram, so I don’t know how many kilograms I need! Most of them are okay with me just buying a few potatoes instead of buying in bulk. I have my trusty salad lady, my apple lady, my honey guy, my baker, and people that I buy nothing from but still ask me how I’m doing. This bazaar is a little treasure to me and definitely something I’ll miss when I go back home. Another reason that I love the bazaar is because I love food. For as long as I remember I’ve loved being in the kitchen, watching the Food Network and even going grocery shopping. Cooking and baking are my favorite ways to spend my spare time. The only problem is, it is just me here in my apartment! The other night I made a pot of borscht and it was enough to feed a family of six, so I ate borscht for maybe four days. Sometimes I make a batch of cookies, then contemplate what to do with 30 cookies other than eat them all. So I often bring my baked goods to my office, my host family or our local library. This is also fun because many Ukrainians haven’t had traditional American baked goods like chocolate chip cookies, banana bread, or brownies before, so it’s a neat way to exchange our cultures and recipes. A salad vendor at the local bazaar. Last week, I made a pan of brownies and brought a platter to my office. I still had about five brownies at home and I thought maybe I could bring them to my salad lady and my apple lady and my potato lady… but I also thought that would be kind of weird. These people work from maybe 6 a.m. to 5 p.m. selling produce and handling money, and I talk to them for a total of five minutes each a week. It’s not really customary to bring near-strangers homemade baked goods. My brownie dilemma also happened to fall on the nine-year anniversary of my father’s suicide. Sometimes I tell myself that this is just a date and doesn’t mean anything, and to be honest in general I try to push this event in my life and this part of me as far back in my memory as I can. Being in a foreign country, speaking a new language and being surrounded by people who you didn’t even know one year ago forces you to evaluate who you are and who you were. It forces you to really examine your own identity and maybe deal with wounds that you left open. I think this past year more than any year, my father’s death has weighed heavy on my heart because I have had so much free time to think about my life before being here, my family back home, and the person that I am becoming without him here to see it. As much as I hate to accept it, this day, especially this year, meant something to me. So I remembered my father, and how he was embarrassingly kind. He was never shy in being nice to people, even if they were strangers. He often went out of his way to make others smile. My father’s death also taught me the value of never wasting a single second hesitating to show somebody love. Suicide leaves those left behind with so many questions of “what if” and “what could I have done.” More than anything, my experience with it has made me value showing love at any time possible through any means. A woman selling her produce at the bazaar. You will never regret doing something kind, or giving somebody an extra hug, or making somebody smile. You will regret feeling like somebody didn’t know their worth. I know that my dad wouldn’t have thought it was weird to bring brownies to the bazaar. So I wrapped individual brownies with foil and brought them to my vendors. Through my broken and nervous Ukrainian I explained that this is my favorite place in a town that’s so far from home, how I know how hard they work every day and that I appreciate them. They know that I’m a volunteer and that I live here alone, and I explained how much I like to bake and that I hope that the brownies give them some energy and that they have a nice day. The three women that I brought the brownies to were all surprised and all of them were smiling. The one who I was most nervous to bring the brownie to was the happiest, and I saw her smile for the first time since I’ve been living here, over a year. A week later, I went back to the bazaar for my weekly haul. One woman immediately brightened up when she saw me and told me that she cried last week when I brought her the brownie. A brownie! It reaffirmed what I had thought about never hesitating to be extra kind and always letting somebody know how appreciated they are. As a Peace Corps Volunteer, sometimes it’s hard to feel like I’m actually successful. We join with the idea of changing the world, but when we get here we realize that we won’t necessarily see the change that we’re creating. It’s like planting seeds for trees that we might not see grow. Seeing how much the ladies at the bazaar appreciated such a small act gave me more inspiration and made me feel like I can make a difference, and helped me to remember that even the small things can be big memories sometimes. Ashley Aulet is a South Florida native currently serving as a Youth Development Volunteer in an NGO in Ukraine. She focuses on subjects like gender equality, tolerance, and healthy lifestyles. Her favorite part of service is watching her students growing in confidence and gradually coming out of their shells.